You probably think your daughter is the cutest, and you're right! 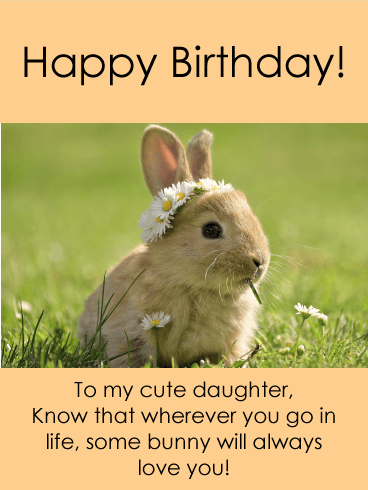 Send that sweetheart this adorable bunny happy birthday card to reassure her that no matter how far she roams, she will always have your love with her. The little bunny sits in a bright field wearing a flower crown of daisies, no one could see this card and wear a frown! Happy Birthday! - To my cute daughter, Know that wherever you go in life, Some bunny will always love you! Toss on some extra candy. More frosting. An array of chocolate seashells. Anything your daughter wants on her cake is going on it. After all, birthday girls can get what they want. But what you want matters too. And that's a daughter who's full of confidence that grows up to be amazing. 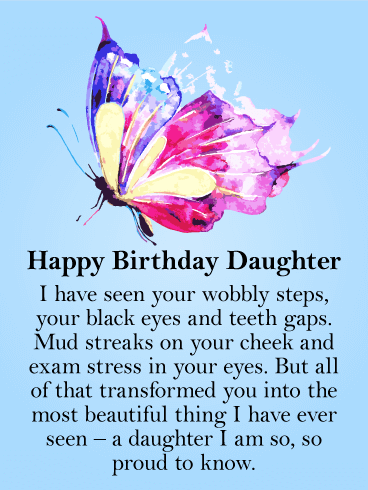 Such things are a result of love and attention, so slather your daughter in them for her birthday – starting with this birthday card! When your daughter first learned the word "no", it was the most annoying thing in the world. Now, it's a sign of her determination and drive to do what's right. Your daughter might still be young, but you can already imagine her future successes and they are glorious. Let her know how fabulous she is on her birthday and shower her with love. The key to your happiness has always been your daughter's. When she smiles, you do. And her laugh is just as infectious. For your daughter's birthday, make her beam brightly because of a perfect day. Let her joy be the focus of her birthday, every moment designed to encourage a giggle or happy clap. 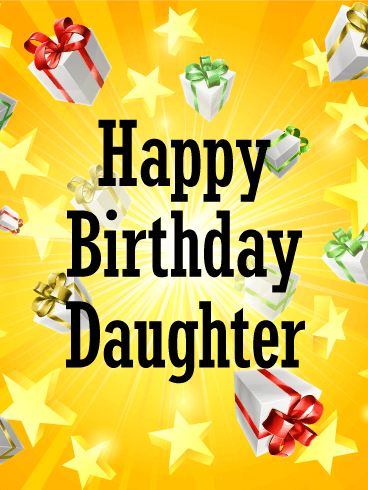 Your daughter deserves a remarkable birthday. Make it so with this birthday card. Fill your daughter's birthday with excitement thanks to this exploding card! Let her know that the day will be bright and full of gifts - from her favorite breakfast to multiple bear hugs and the box in pink you've been hiding in your closet. 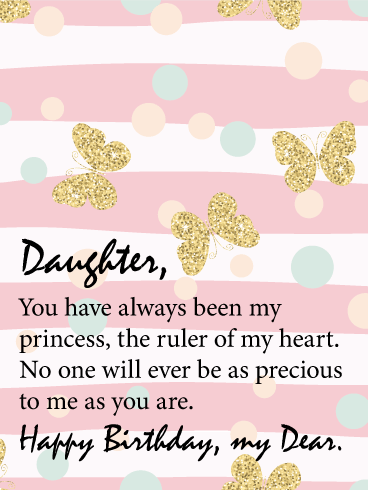 Your daughter is a special person. Her birthday should be just as special. Start the day right with this birthday card. Each step down the road, each obstacle we overcome, makes us more beautiful and more powerful. And watching your daughter become a remarkable woman? There's nothing better in the world. She will shake the foundations of the world, you know it in your heart. On your daughter's birthday, let her know how excited you are to watch her rule. Tell her that you know she will be incredible. And tell her "happy birthday" too. Pretty, pretty princess is not just a game you've played with your daughter a million times. It's your honest opinion of who your daughter is. Regal, polite, and yes a bit demanding. But you love her and would have it no other way. You have built your life around her. 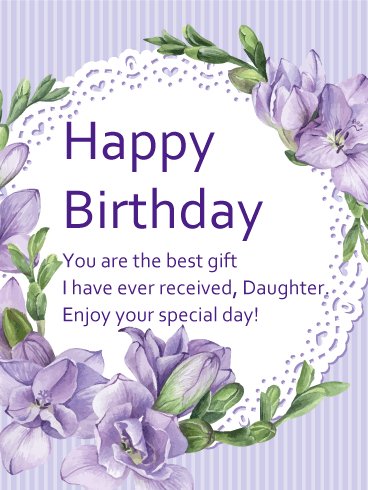 Let your daughter know how special she is on her birthday. She's truly one of a kind. 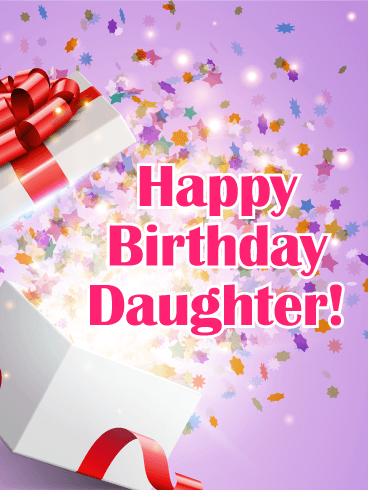 Start your daughter's birthday off right with this explosion of goodwill! 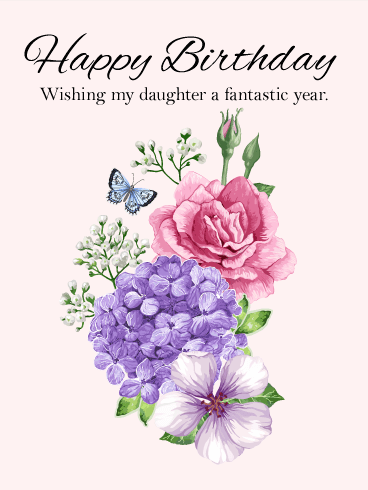 This birthday card is bursting with all the well wishes and amazingly good things you are sending to your daughter today. A thousand smiles. A sudden good fortune. Peaceful moments. The perfect piece of cake. A blanket of warm love and support. 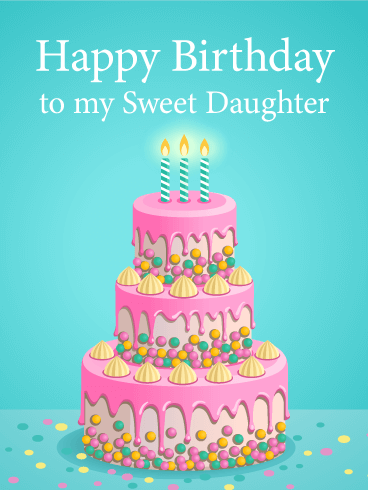 Wish all this and more to your daughter for her birthday! One of the joys of parenting is watching children grow from small, defenseless bundles to adults capable of changing the world. From awkward toddler to stunning career woman, nothing is as amazing as witnessing the transformation of someone into a beautiful person. 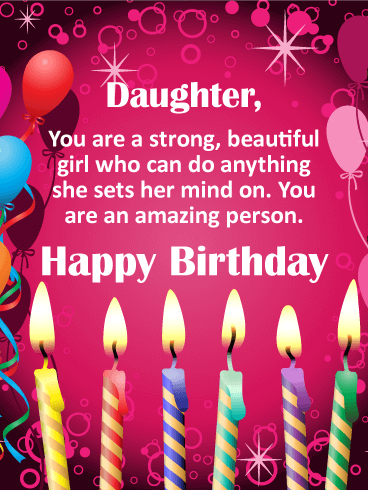 Let your daughter know how remarkable she is on her birthday. How gorgeous. How breath-taking. Your daughter is amazing. Don’t let her forget that on her birthday. From her sticky fingers to her uncoordinated cheek kisses, your daughter knows all the ways to melt your heart. Kind and compassionate, you'll be hard-pressed to find someone with a sweeter soul or bright outlook on life. 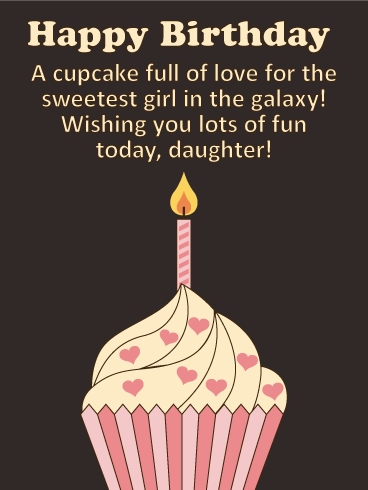 Let your daughter know how special she is on her birthday with this love-infused cupcake! And let her know this is one treat she should keep to herself. Birthday cupcakes are for birthday girls. What daughter cares about making lemonade from a lemon year when she's got the support of her parents behind her wishing her well? 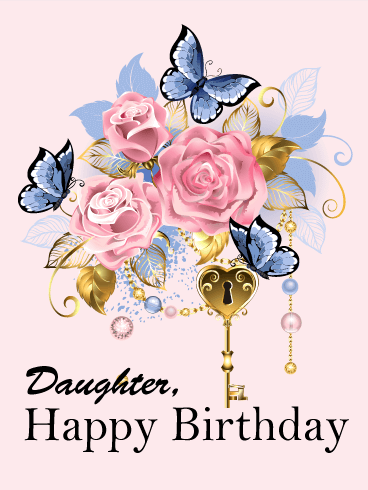 Let your daughter know that you are wishing her success this year - in love, in life, in her career - so that she will have the ultimate birthday. 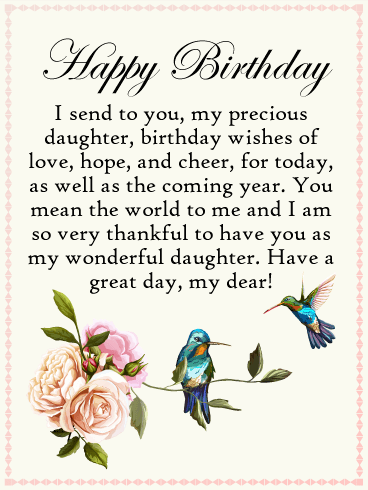 Birthday wishes from the heart are the best gift a daughter could receive. Make sure your daughter gets all of yours.